Product quality is a prerequisite to organizational success and plays a pivotal role in customer satisfaction. PSO's Quality Assurance (QA) department ensures product quality throughout the supply chain. The department test products as per approved specifications The department provides technical services for testing products through state-of-the-art laboratories and mobile quality testing vans nationwide. 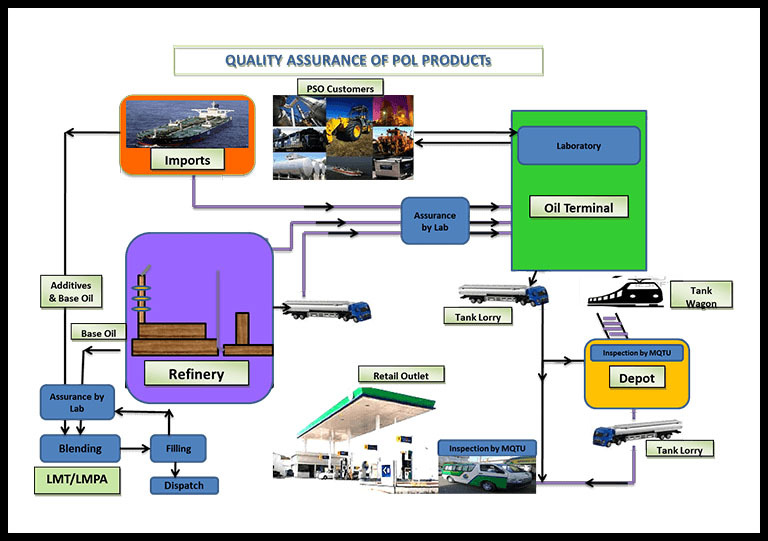 PSO as the leading Oil Marketing Company (OMC) in Pakistan tests products by utilizing Mobile Quality Testing Units (MQTU) throughout Pakistan. This implementation was initiated in 1998 with 3 vans in major cities of Pakistan i.e. Karachi, Lahore and Islamabad. At present, 25 MQTU’s are stationed at 18 locations. The objective of MQTU’s is to check and monitor the Quality and Quantity (Q&Q) of products being delivered to retail/industrial customers. To ensure quality specification a van will randomly visit depots and installations to check the quality of petroleum products. MQTU’s check the product against the critical test parameters of a particular product which further enhance customer satisfaction. Stationary Laboratories ensure that petroleum product consignments received from refineries, imported via ocean tankers and products manufactured at lubricant plants meet approved specifications. Stationary laboratories at eight (08) locations i.e., Keamari Terminal “A”, Lubricant Manufacturing Terminal, Zulfiqarabad Oil Terminal, Lalpir Depot, Machike Installation, Faisalabad Depot, Sihala Installation and Shikarpur Installation are equipped to cater to a wide range of petroleum products. Testing is conducted as per international standards such as the American Society for Testing and Material (ASTM) and British Institute of Petroleum (IP).